The Lakeview Gators traveled to Mansfield to take on the Wolverines Friday, Sept. 29 with hopes of getting their first win of the season, but it was not to be. The Gators received great field position at the 41-yard line on their first possession of the game after the Wolverines attempted an onside kick, but the Gators were unable to capitalize and were forced to punt the ball away. The game through the first quarter continue to be a defensive battle until the Wolverines took advantage of the miscommunication getting lined-up on the Gators defense. They scored the first points of the game with a 64-yard touchdown run. The scoring drive was capped off with a 2-point conversion to put the score at 8 to 0 in favor of the Wolverines. Later in the first quarter, the Wolverines were attempting to score on another long run but had the football stripped away by #11 Dwaelon Shepherd and was recovered by #6 Demondre Young. 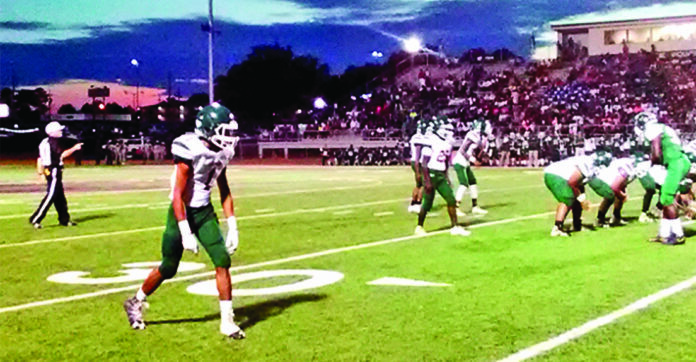 As the night continued, penalties and missed opportunities plagued the Gators as Mansfield went on to win the game 36 – 0. Some bright spots for the Gators to build on for the rest of the season include 82 total passing yards by quarterback Demondre Young. Dwaelon Shepherd caught 67 of those passing yards. On the defensive side, Joseph Gallien led with 9 tackles and 1 pass breakup. Dillion Longino did an excellent job of contributing with 4 solo tackles and helped in recovering a fumble. The Gators will once again be on the road to face Holy Savior Mernard in Alexandria in hopes of getting a win to start district play and increase their chances of making the playoffs for the second straight year. Photo Information: #1 Damien Brown lines up to receive a pass from #6 Demondre Young against the Wolverines Friday night in Mansfield.